This type of forging (called anticlastic raising) persuades the metal into opposing itself. Concave curves and tight tapering enclosed curves are made possible with this technique. Bangles, rings and neck-pieces as well as hollow, tubular handles are born of this method. 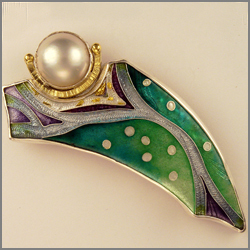 The term Cloisonné is derived from the French, cloisons, meaning “partitioned cells”. Champlevé refers to a technique where a recess is made in the silver either by incising, etching or making a framework that is soldered onto a fine (pure) silver plate. Thin metal wires (cloisons) of either fine silver or gold are first bent into various shapes to separate the enamels from one another. After the first thin layer of enamel is applied and dried it is ready to be kiln fired, somewhere around 790 – 810 degrees celsius. Enamel colour does not blend together when it melts, it is the painstaking skill of the practitioner who by careful placement of each grain achieves the gradation of colour and appearance of depth. The enamels continue to be built up and fired repeatedly until the colours become vibrant and there is a feeling of depth to the piece. Each large piece may be fired over twenty times. Unlike pottery, each piece is always fired on its own. The piece then needs to be refined by removing any excess enamel that has covered the cloisons. Using a series of diamond files (from coarse to very fine) the piece is gently filed back until the cloisons are revealed and the depth of the enamel is consistent. All scratches must be removed from the enamel and in the case of champlevé, the silver framework must also be perfect. It’s usually necessary to use a series of very fine grit diamond sanding papers to perfect the finish. 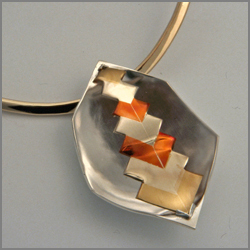 The final firing gives the glassy finish enamels are known for. 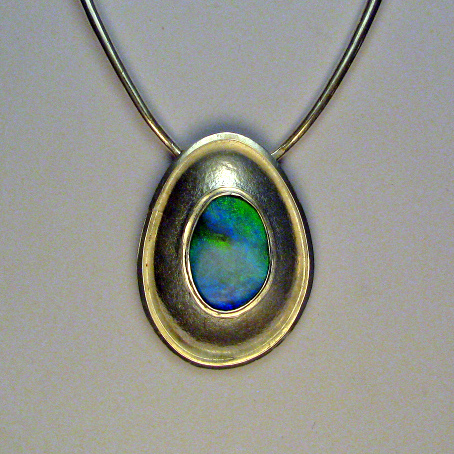 The final depth of the finished enamel is less than .7mm (excluding the depth of the silver). 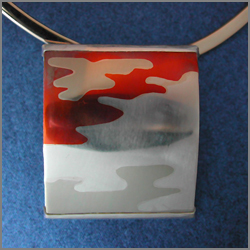 Enameling is a labour intensive art and not without risk, as silver has a relatively low melting point. The enamelist must be vigilant in order to ensure that the work is not lost during the firing process. 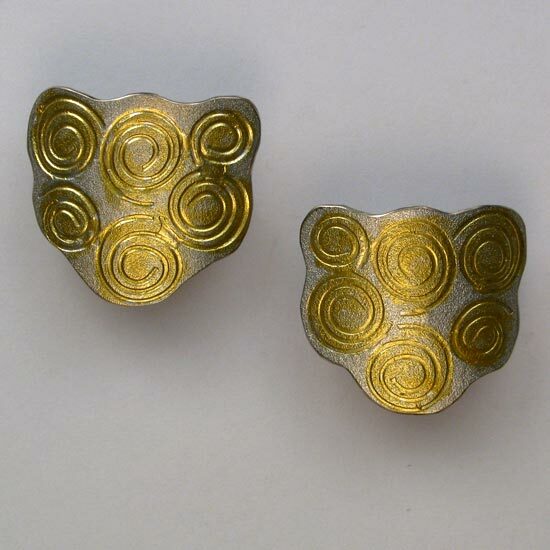 Keum Boo (also spelled kum-bu) is an ancient Korean technique of permanently bonding 23k gold to silver, giving the appearance of the two metals being one. After completing the process the piece may be embossed (textured). Embossing: Refers to patterns and designs imprinted onto metal by using extreme pressure, usually with the aid of a rolling mill. Using hammers, metal can be stretched, curved, flattened, folded and domed. Forging is the basis of silversmithing. From bowls and cutlery to rings and collars, knowledge of forging techniques is essential. When a three dimensional object requires a consistent shape, I hand make my own die and then form the piece either manually with a vise or a hydraulic press. I always test the accuracy of the die with copper plate before I commit myself using gold or silver. This is similar to the ‘married metal’ method. 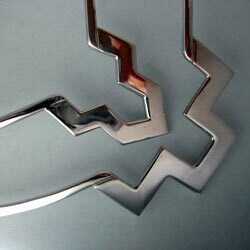 A design is saw-pierced from one metal and inlayed into an exactly matching opening of a different metal. The pieces are soldered together with high temperature solder. As with married metal, the piece must be filed back until dead flat and all solder removed. 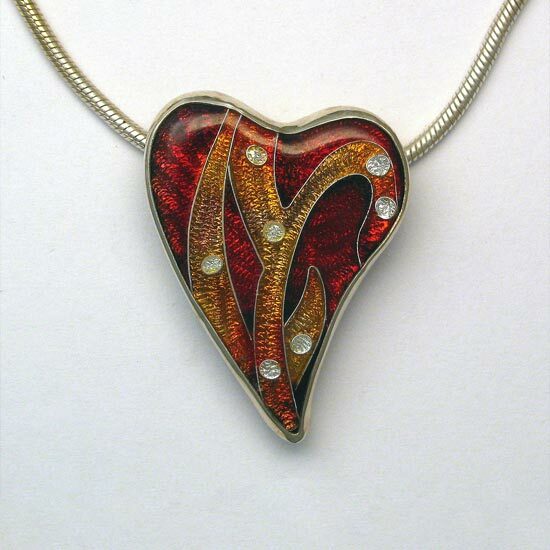 It can be coloured with an open flame or left to oxidise naturally. It can also be sealed to preserve the colour. Married metal is a term used to describe the process of soldering different metals together using high temperature solder. 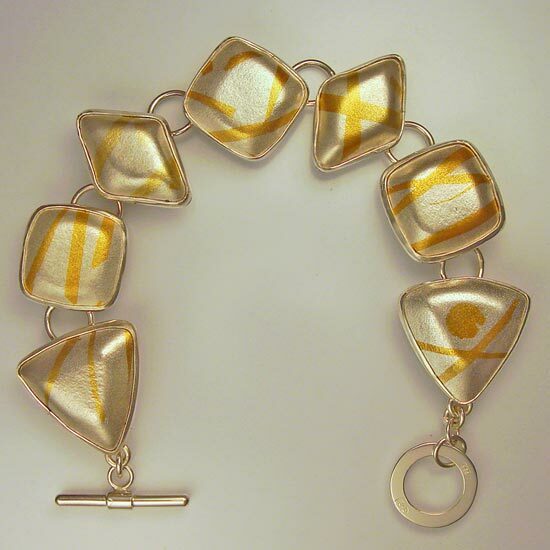 I usually use a combination of silver, gilding metal, nickel silver and copper, although other metals can be used. 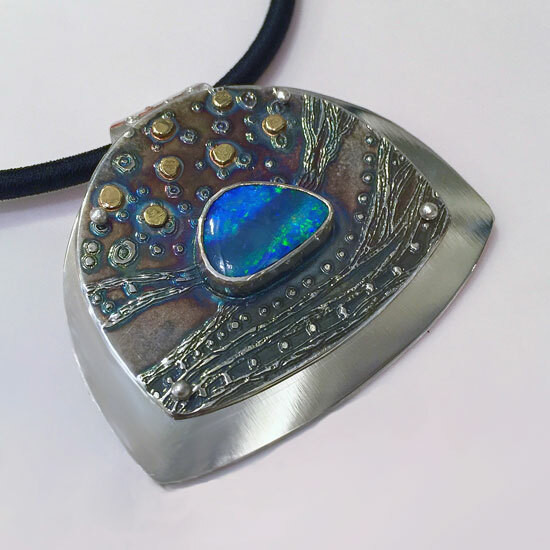 The finished piece can be coloured by introducing an open flame which will intensify the colour of the metals, or it can be left to oxidise naturally. Sometimes I use a sealant to keep the colour permanent. I usually set the piece as I would a stone because to solder it again I run the risk of the joins opening and the piece buckling. The etching technique uses nitric acid to corrode sterling silver. A resist is applied to mask the areas that are not to be etched. Refers to the process of incising lines into metal by using sharp tools called gravers. Sometimes this is done to the silver before enameling to give added depth and texture to the piece. The name repoussé is derived from the French pousser, “to push forward”. I love that you can take a flat piece of silver sheet, coax it into 3 dimensional life, and turn it into something wonderful. The piece is secured face down in heated pitch and then shaped from the back with either steel or wooden punches and a mallet or hammer. Care must be taken not to destroy the surface by inconsistent hammer blows, easy does it. Metal is not very forgiving if you put big dents or scratches in it. Consistent hammering makes a beautiful texture too.